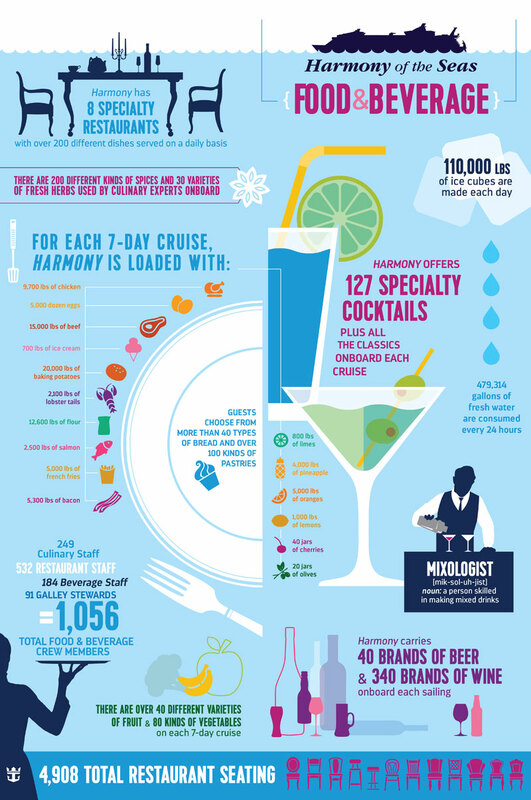 Royal Caribbean’s Harmony of the Seas is the largest cruise ship in the world, carrying 5,479 passengers at double occupancy and as many as 6,780 passengers at full capacity. That’s a lot of people, but the good news is that much thought went into making the ship not feel completely overwhelming. The streamlined embarkation process lets you check in before you arrive at the port (even uploading your photo from home), so you can practically walk right onto the ship. And Harmony is also divided into seven different “neighborhoods” that feel manageable to navigate once you are on board. Still, this really is a big ship. How big? It is 1,188 feet long — nearly twice as long as Empress of the Seas (the line’s smallest ship at 692 feet long). The ship has another superlative besides being the largest — the Ultimate Abyss is the tallest slide at sea (45.72 meters above sea level). Plus there’s a zip line, surfing simulator, two rock climbing walls, and an ice-skating rink on board. Doing all of those activities will really work up an appetite. Harmony of the Seas has 20 restaurants on board, where you can grab hot dogs from the casual Boardwalk Dog House or reserve a seat at the 14-person Chef’s Table for a five-course tasting menu. There are also plenty of bars where you can wet your whistle. So what does it take to feed all of those people? In just a week, the ship goes through 5,000 dozen eggs, 2,100 pounds of lobster tail, and 25,000 pounds of potatoes (both baked and fried). There are also 127 different specialty cocktails to choose from, which require 800 pounds of limes and 4,000 pounds of pineapple, plus garnishes to the tune of 40 jars of cherries and 20 jars of olives. Here’s a breakdown of what else they cook up in the course of a week.